An iridescent beetle, bright as a bead, has caught a whiff of paradise. She makes a beeline for a pile of fresh manure, high as a hill to her, recently left behind by a Maiasaurus striding through the rookery on some motherly errand. It’s a noisy place, this. The herd is a big one, and there are hundreds of nests here. Adult animals rumble, or possibly honk or hiss as they jostle each other. Some of the nests are already full of broken eggshells and little Maiasaurs bawling to be fed. The beetle takes no more notice of the clamoring dinosaurs than they do of her. She has family matters of her own to attend to. She’s a dung beetle, and, the risk of getting stepped on notwithstanding, hanging around a bunch of nine-meter-long herbivores the size of SUVs means living very large. She burrows eagerly into the heap. Later, burrows and their chiropteran hardihood will help her million-times-great-grandchildren survive the asteroid impact that will doom Maiasaura and most of her kind to extinction. Later, her descendants will be digging into the dung of proto-elephants on the savannahs where an ape will stand, starting no end of trouble. Later, pyramids will rise, and the civilization that erects them will fall, having ironically put the humble dung beetle, the scarab, at the very center of their cosmology. And later still, uncountable insect generations later, in the later we live in, this nesting ground will be Montana, Maiasaurus will be the stuff of museum exhibits and documentaries on the Discovery Channel, and dungbeetles will be busy among the bowel movements of animals on every continent but Antarctica. For now, a “now” seventy-five million years ago, this beetle will lay her eggs inside the tunnel she’s made, and seal it snugly behind her when she leaves, ensuring that the larva will be secure in a chamber literally made of food. “It’s dinner and a nursery,” notes Anthony Martin, professor of practice in the Department of Environmental Studies in Emory College of Arts and Sciences and the author of a new book, Dinosaurs without Bones. 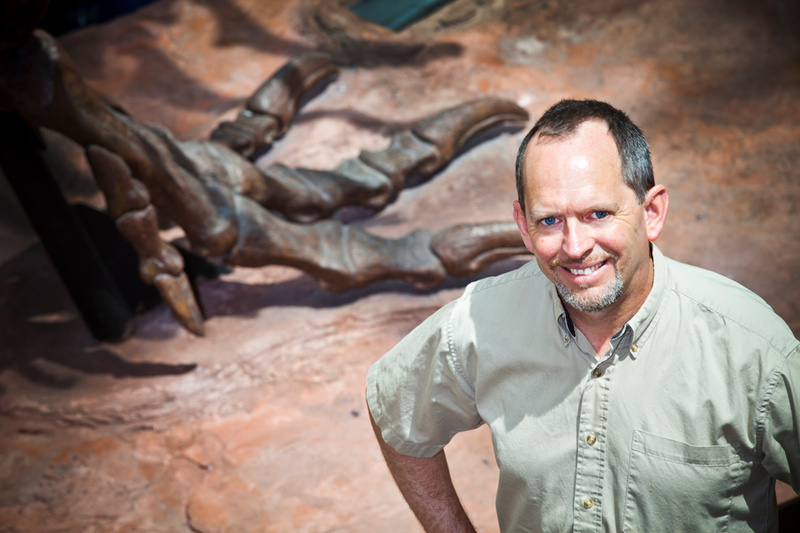 Trained as a paleontologist at the University of Georgia, Martin specializes in paleoichnology, the study of traces left on ancient environments by living things, from footprints to, well, feces. It is coprolites, or fossilized dinosaur dung, such as the beetle-bored specimens found around the Maiasaurus nests of Montana’s famed “egg mountain,” that allow us to reconstruct the heartwarming domestic scene described above. Martin’s book collects and describes these and scores of other fascinating finds that he and his fellow trackers are using to glean surprisingly intimate insights into how dinosaurs and other prehistoric creatures moved, healed, hunted, ate, and excreted. Trace fossils are substantially more rare, and frequently more hotly contested, than are so-called body fossils, the mineralized mortal remains of animals, generally the hard stuff like bones, teeth, and shells. This should come as no surprise, really; the preservation of such osteological prodigies is much easier to get your head around than that of something as ephemeral as a footprint on a shoreline, the impression of scaly skin or downy feathers left in soft mud, or even the semidigested last meal of a carnivore swept away by some catastrophe. As mind-boggling as it is that natural processes can turn such fleeting phenomena into part of the Earth’s permanent record in the first place, the feats of the small, dedicated, and occasionally eccentric fraternity that scours the globe and wracks their brains to find and interpret trace fossils are equally astounding. Paleoichnologists (with paleobotanists, Martin quips, the Rodney Dangerfields of the discipline—no respect) go to extraordinary and occasionally comical lengths to make sense of the trace fossil record, which is often written in the most inaccessibly ambiguous of terms. Sure, some of it is straightforward enough, such as the beautifully preserved dinosaur tracks at Lark Quarry in Australia or near the Purgatory River in the US, but what do we make of the stones apparently deliberately swallowed by carnivorous dinosaurs, the staccato spoor of a dinosaur who seems to be either swimming or hopping like a Mesozoic kangaroo, or the trench in an ancient sand dune that might be the record of a prehistoric giant taking a monster leak? 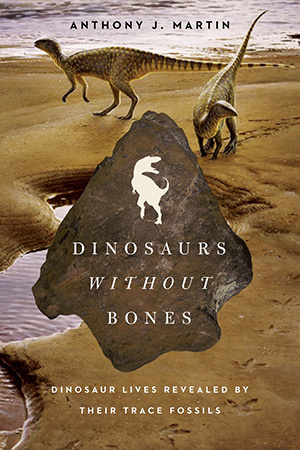 Like many of the best works of natural history, Dinosaurs without Bones is part science book and part travelogue. Martin has followed the trail of the dinosaurs across twenty-nine states and fifteen countries, including Korea, Turkey, New Zealand, Mexico, and Peru, and across hundreds of millions of years, from the remote past to the present. Some of the delights, in fact, of Martin’s book are the accounts of his adventures in neoichnology—particularly his work with the traces left by the direct-line descendants of dinosaurs we see every day, the birds. Putting the trace fossil record in dialogue with research on tracks and traces in extant environments allows ichnologists, working even from very scanty clues, to see the ancient world in far richer hues, as a burgeoning, breathing, living world, rather than a valley of dry bones. Okay, so a few of his forays into the inner life of dinosaurs are more “ewww”-inspiring than awe inspiring, but Martin’s is an invaluable addition to our understanding of dinosaurs, and more generally of the natural world, past and present. Today, in the comfortable, high-tech twenty-first century, Martin and his fellow dinosaur trackers are rediscovering the ancient science of tracking and using it to shed a brand-new light on the dinosaur era—and also perhaps on our own. Ichnology also can illuminate the complexity and hidden wonders of the contemporary environment. Ichnology, in fact, may be the apotheosis of the liberal arts. Dinosaurs without Bones offers a steady diet of puns, irreverent cultural references, and toothsome vignettes of life in the field. There is much in Martin’s book for specialists, science fans, and nature lovers—and a few surprises for even the most hard-core paleo-nerds.